Relax & unwind with the alluring aromas of orange, cedarwood & clove. This sumptuous fresh blend is pure sophistication in a jar. Make your home your sanctuary with this favoured scent. Discovered these wonderful candles that outperform other high-end and well known rivals. The perfume pervades the room and lasts and lasts. I particularly love ‘Retreat’ and ‘Exotic’- natural scents rather than artificial or chemical. Worth every penny! Time candles have to be the nicest I have ever bought. I usually burn Jo Malone candles but after using Time I will never change back. I find they give off just the right amount of scent without being overpowering and the scents last until the candles have ran out. I have to say my favourite is Retreat. They don’t give off nasty fumes and love the way the candles melt into an oil. I can’t recommend these candles enough they make a beautiful gift in their luxury packaging. I’ll definitely be a regular buyer. 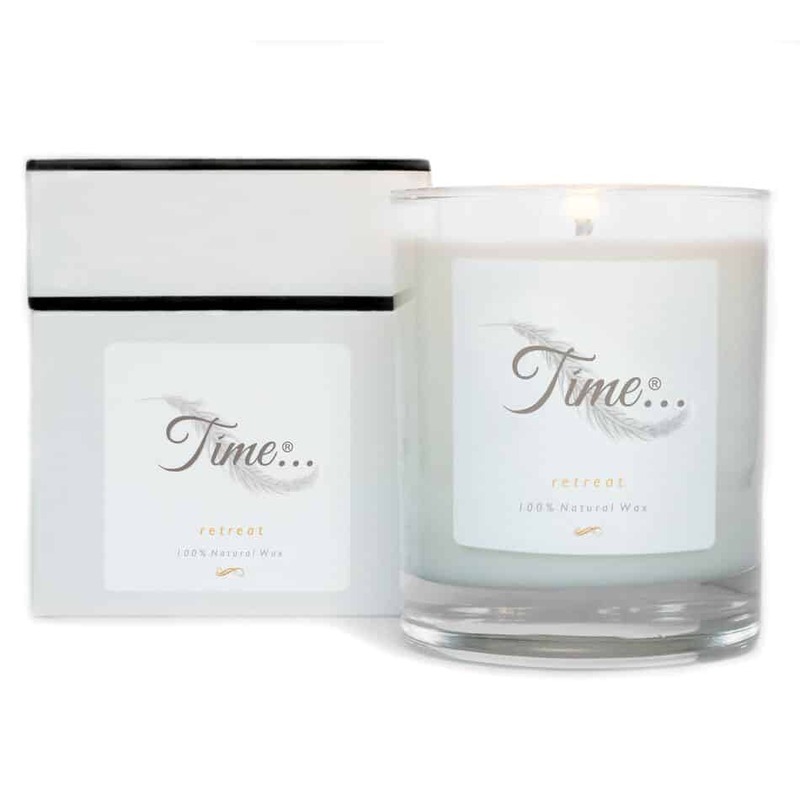 On unpacking the beautiful boxed Time Retreat candle the smell was divine. Just having it on display the aroma filled the room, once lit this intensified. There were no black smoke deposits like most other candles, it burnt evenly, premium quality and would definitely purchase another one! Retreat is a beautiful aroma and it fills the whole room once lit. Already ordered another one, great value for money. Beautiful selection of time candles. Definitely recommend the retreat scent. Perfect way to relax after a long day and a great idea for a gift. Will be buying again! I’m a big fan of scented candles and bought me “retreat” as a birthday present and it didn’t disappoint. As soon as you enter a room it’s the first thing that hits you. I love that it burns evenly too! I can’t wait to try all the other scents!! I was recommended this brand by a friend because I love my candles and that fact that they are organic and the wick being led free was a sheer bonus! I’ll make sure to keep recommending your brand to my friends and family! On opening the smartly presented box you are presented with such an inspiring little quote! What a lovely touch, the designer has really thought of everything to make it a special experience for the end user! the aroma lifts a room instantly, even when the candle isn’t lit! What has surprised me is that when the candle is burnt the wax melts at a level rate, meaning no need to trim the excess wax and remelt (as with other brands) and doesn’t leave that black layer that candles usually leave. Very cleverly designed. My favourite of the whole collection is definitely ‘retreat’. Will definitely be recommending these to everyone and will most definitely be repurchasing. Perfect as a gift! !